This alleged single signed ball by HOFer Walter Johnson was listed for sale on eBay for $80,000. Experts doubt its authenticity. 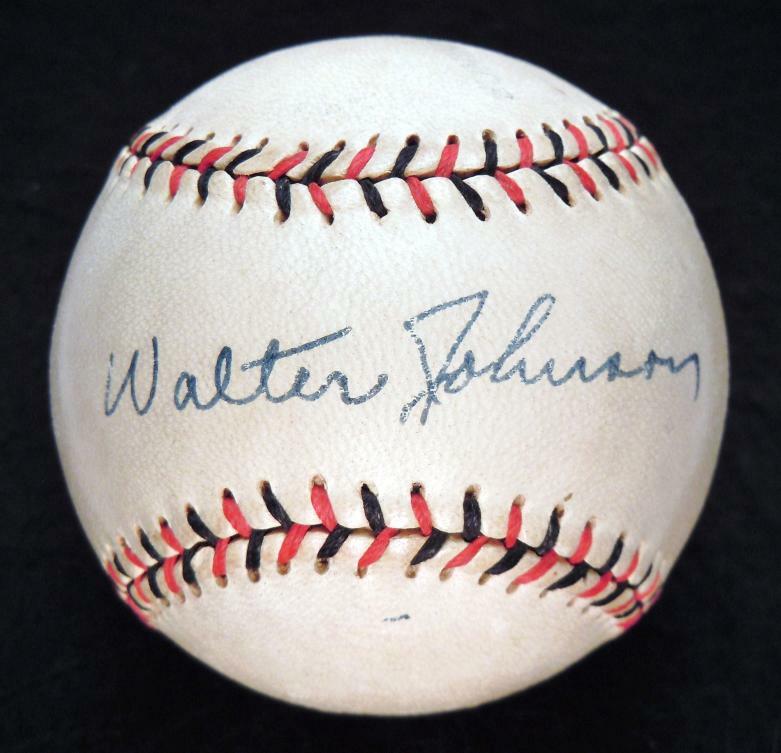 The Walter Johnson autograph appearing on the alleged 1920s to 1930s baseball that was offered for sale doesn’t resemble the authentic signature of the Hall of Fame pitcher nicknamed “The Big Train.” When shown the image of the ball appeared on the eBay website expert Ron Keurajian told us he was already aware of the ball and noted that the Johnson signature was “apocryphal”. He added, “In my opinion the signature on that ball is a forgery.” Hauls of Shame shares that opinion about the signature that lacks the fluidity and feel of Johnson’s handwriting and appears to be labored and executed in a not-so-steady hand. The signature, originally authenticated by JSA in 2010, was touted by the seller as “The Finest Walter Johnson Single Signed Baseball in the Hobby JSA,” however, it appears that the eBay seller may be another victim of authentication malpractice committed by a third-party authenticator. 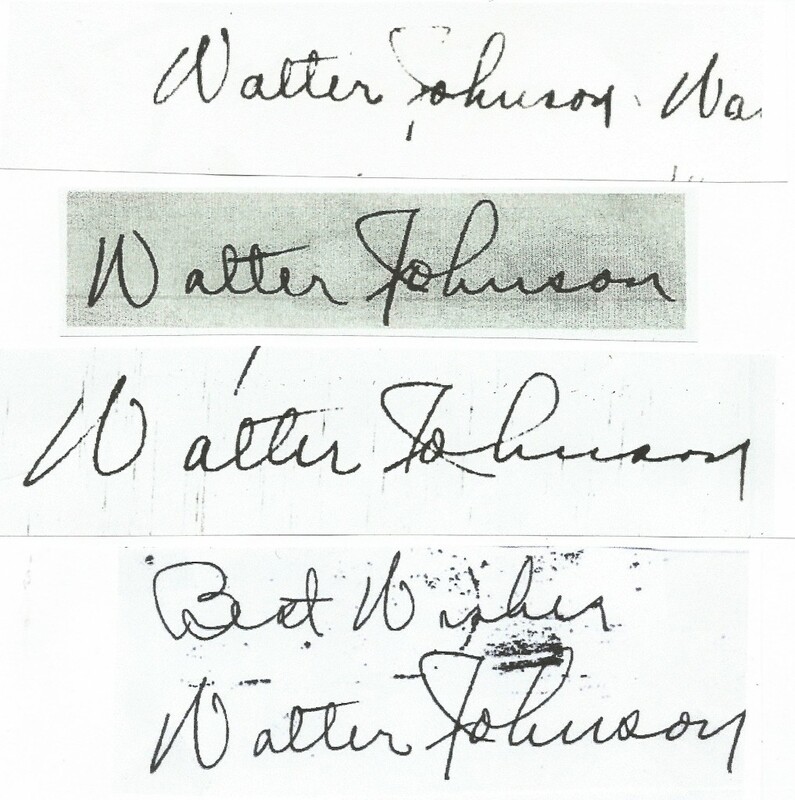 These four exemplars depict authentic signatures of Walter Johnson that will be featured in Ron Keurajian's book. Hauls of Shame was first informed about the sale of the questioned Johnson ball back in January when a thread on Net54, featured a discussion about the ball between the seller and another collector named Rick Gallway, who questioned its authenticity. Melchionno was alluding in his email to the authenticator he endorses on his website, James Spence Authentication (JSA). The third-party authentication company has been recognized as a leader (along with PSA/DNA) by eBay and all of the major auction houses. Despite a myriad of expensive errors, however, JSA still receives strong support from collectors and dealers who rely on their services to buy and sell items. Recent investigations by Hauls of Shame in regard to high-end Babe Ruth autographs and signed items from the 1939 Baseball Hall of Fame Induction in Cooperstown have opened the eyes of many to the serious deficiencies related to JSA’s work product. Now, the $80,000 Walter Johnson ball removed from eBay has opened the door for a closer examination of other Walter Johnson autographs previously certified by the third party authenticators (TPAs). Looking at less than a dozen big-ticket Walter Johnson autographed baseballs sold at auction with JSA paperwork, it is shocking to see the great disparity from example to example and the visible evidence suggesting that Johnson may have never signed the majority of the baseballs we examined images of. 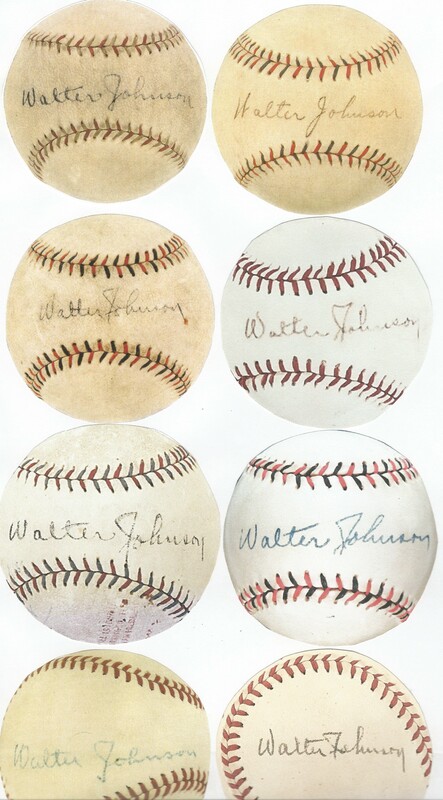 All eight of these baseballs allegedly signed by HOFer Walter Johnson were certified as authentic by JSA. Some experts, however, doubt that any of them are genuine. We showed these eight JSA-certified Walter Johnson signed baseballs to several experts who each told us that in their opinion, they would not be able to certify them as authentic. One expert thought that the ball shown in the second row, left, might be genuine. As for the images of the second set of Johnson balls, the experts thought they were genuine, but there was some disagreement about the example shown on the top row, right, which would need to be examined in person to render a definitive opinion. 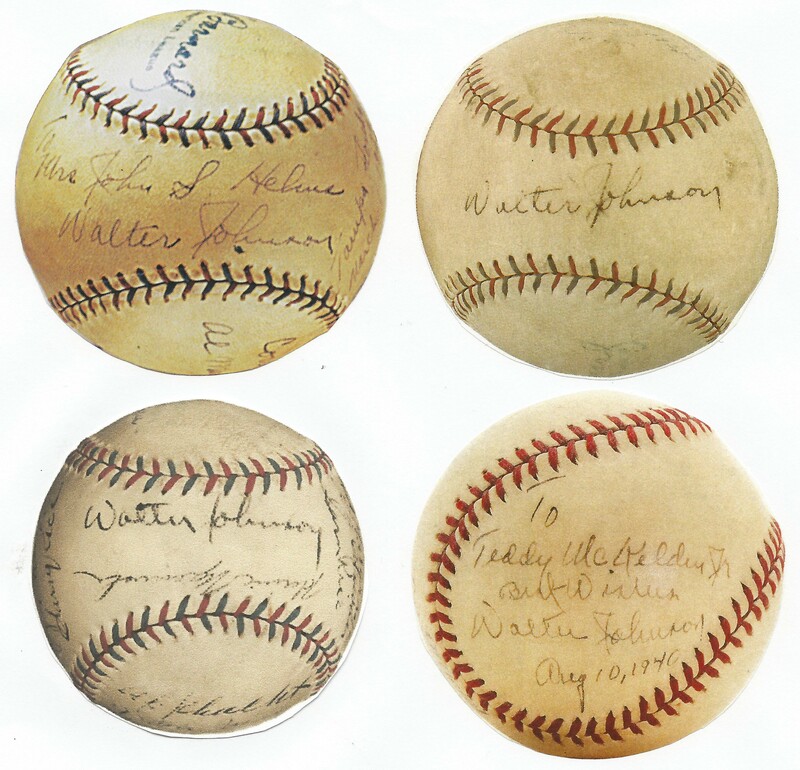 These four balls appear to bear authentic signatures of Walter Johnson. Similar to our on-going investigation of the Babe Ruth single signed baseballs, this study of Johnson’s signature illuminates further problems with the authentication capabilities of outfits like JSA and PSA. It is the opinion of Hauls of Shame that similar problems exist for nearly every Hall of Famer signature that the TPAs have handled. Collectors, dealers and auctioneers have, for more than a decade, placed their trust in the hands of PSA and JSA for their authentications, but a closer look at the substance of their work has many in the hobby questioning their credibility. All collectors need to do is open their eyes and take a closer look at these Johnson balls to render their own opinions. James Spence and JSA did not respond to inquiries for comment on the withdrawal of the eBay listing accompanied by their LOA. The eBay seller Casey at Bat Collectibles also declined comment. Good job for Ebay, now when are they going to police Babe Ruth. Most on there are fake????? They don’t know Ruth, they don’t know Wagner, they don’t know Johnson, very disturbing as usual. Unfortunately, Babe Ruth is the forgers best friend. I see lots of questionable Ruth autographs with JSA and PSA letters of authenticity. How JSA certified some of these Johnson balls is beyond belief. I wonder what those sold for? It looks like the ball on the top row left side sold for $13,753 in a mastro auction in 2004 and the ball in the third row to the left also sold in a mastro auctionin 2005 for $18,307. It looks like the ball on the top row, right, sold for $18,725 in a Mastro Auction in May of 2000. The ball appearing on second row, left, sold at REA for $6,960, and second row , right, $4,810 by Mastro. Ball on bottom row, left, sold at REA in Nov. 2001 for $6.726. This one we felt very comfortable with – a great Johnson single that was acquired by the consignor’s family.